Once upon a time I used to write quite a bit about the movies I'd been watching. Since the advent of GetGlue in my life and the general rise in social media I've become a bit remiss. Part of the problem is that it is very rare these days we watch a movie that makes me go 'wow'. Yes, I want to be a comic book artist! 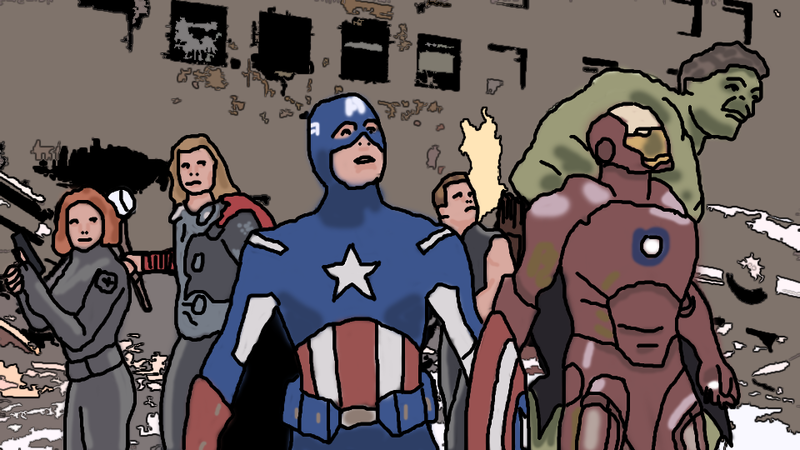 Last night we watched 'Avengers Assemble'. As an older sister of a very sporty totally non-geek younger brother I missed out on the whole comic book scene; definitely missed out. My youthful acquaintances with comics were mostly the DC world (Superman and Batman) as those were the movies of my generation. My Marvel experience was limited to the Spiderman cartoons on Saturday mornings as a student - although I was an enthusiastic consumer! So the whole Marvel-verse movie scene has been fantastic for me. 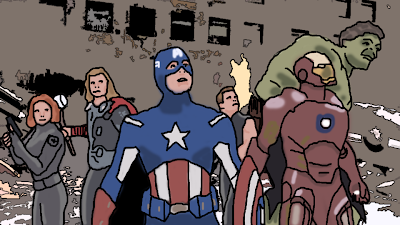 I've loved 'Iron Man', really enjoyed 'Captain America' and 'Thor' and then last night they all came together in 'Avengers Assemble'. Little niggle that it wasn't available to rent on BluRay but as I have a feeling the Better-half will someday end up owning it so that will be OK.
Movies based on comic books are excellent Saturday night movie fare. Action, adventure, ordinary people doing extraordinary things, and some superb comedy lines. Samuel L Jackson, Robert Downey Jr, what's not to like?! And for geek-verse friends who wondered where Joss Wheedon had got to after the lamented Buffy, Angel and Firefly (and not lamented in this house Dollhouse); he was writing and directing this film. Agent Maria Hill: If we can't control the Tesseract's energy, there may not be a minimum safe distance. Fury: Bring the carrier about to a one-eight-zero heading south. Take us to the water. Navigation: We're flying blind. The navigation's recalibrating after the engine failure. Fury: Is the sun coming up?